While visiting the island of Noirmoutier, we decided to do a day-trip to the neighboring island of Yeu, which is accessible by a fast ferry that leaves from the mainland at Fromentine and takes just 30 minutes to make the trip. Another way to get there is by helicopter. 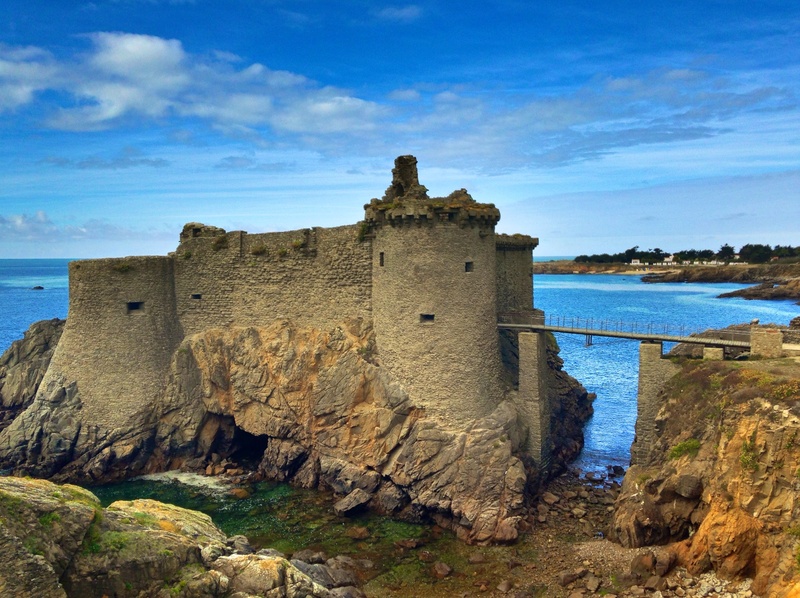 It costs $100 euros and you get to take in the spectacular coastline of the continent, Noirmoutier and Yeu. Taking the ferry in one direction and the flying the other way would be a good option. Ile d’Yeu is only nine square miles in size and has a population of 5,000 (although that grows significantly in the summer months). Is is slightly more hilly than Noirmoutier (which is as flat as a pancake) and has a much more rugged coastline. It is wonderfully set up for biking, and that seems to be the most practical way to get around the island. The main promenade of Joinville, as you get off the ferry, is lined with bike shops of all types. It can be a fully day of biking taking in all of the island, and for those who haven’t biked much there are electric bikes to make those hills a little easier. It also seems to be very popular with hikers and there are trails all throughout the island. and then cut across the island to have lunch in Joinville (there really is no other place to have lunch, except in Joinville). We ate at El Malougo and enjoyed moules frites, both agreeing that they may have been the best moule we’ve had. They offer five different sauces, the Malougo sauce was exceptional, but they also have a curry and mariniere. We were going to have burgers at Foxy Burger as they looked great, but it was closed the day we were there. Le Gavroche for pizza or burgers also looked very good, but it was packed when we went by. So get there early if you want a table. After lunch we headed easterly, following along an exceptional shoreline with a wonderful walking beach which must be close to three kilometers long. We swam again at Plages des Vielles and then headed back to Joinville to catch our ferry.